The humidity and temperature are both high in the Boston area as I write this blog. It’s mid September and we’re having a summer refresher with the temperature in the 90s but the humidity makes it feels like it’s in the low 100s. For acoustic instruments, if there is anything to worry about it’s too much humidity today. But we’ve already experienced some cool fall days where the humidity has fallen to beneath 40%. Time to get ready for the dry, cold days of a New England winter. Which brings me to today’s topic: humidification systems for your guitar case. Fifty years ago my guitar playing buddy put a cut apple in his guitar case to keep his guitar humidified. We’ve come a long way since rotten apples was the preferred humidification system for your acoustic guitar. Even 10 years ago the typical way to humidify an acoustic instrument was with a sponge soaked in water. Dampit™ and early Planet Waves systems were just a sponge with a containment system to keep water from directly touching your guitar. Now there are much better systems available. Most are longer lasting than a simple sponge yet are designed to keep any water from leaking onto your instrument. Some also control the humidity so that it is maintained in the proper 40% to 50% range. The following is a survey of some of the options available. The basic water in a sponge in a container in your case systems are still available and still work if you check them and the humidity regularly. This was the first system I used for my acoustic guitars. A flexible cover with many holes encloses a sponge. The Dampit tube hangs in your guitar to provide humidification. Not very sophisticated but it works. The planet waves devices were the second system I tried. I’ve got a bunch of them in different sizes and shapes. They make some for cases and for smaller instruments. The type pictured hangs into the sound hole of your acoustic guitar, cleverly supported by the adjacent strings (G & D). The strings fit in a tab molded into the side of the plastic housing. These come with a syringe for filling the device (no needle – special tip designed to fit device). I found this easier and less messy than the Dampit. But still just basic water in a sponge for humidification. I’ve never tried the Kyser Humdifier but I’ve had friends who have used them.The main feature is the device is designed to cover the sound hole to help keep the humidity in your guitar. The basic theme of sponge in a case is common and I’m sure I haven’t captured all the companies making this type of guitar humidifier. In fact, there is no sponge for this system. This uses chemicals designed to automatically control the humidity in your guitar case so it remains just over 40% Relative Humidity – this is the recommended humidity range for acoustic instruments. How does it work. I described how you could control humidity using chemicals in an older post. The Humipak system must be doing something similar. One of the great things about this system is that if the humidity is too high, this will adsorb the excess moisture from the air to keep the humidity controlled. So far, the systems described are designed to somehow hang in your guitar through the sound hole. Oasis also makes this type of humidifier but the one shown here is designed to mount to the inside of your guitar case. Magnets hold the humidifier to a metal clip that either slides over the side of the case or is attached to the inside of the case. I’ve never used an Oasis humidifier but they seem interesting. The unique feature, in addition to mounting to your case, is the humidifier is filled with gel beads that swell when you add water. This keeps the water from leaking and also controls how rapidly the moisture is released. They have another model that gives twice the output – but lasts half as long. Which version you require depends on how dry it is where you store your guitar. They recommend the high output model if you expect humidities below 20%. The case pictured below is the Metro model of the Humicase. They also have a more traditional and less expensive model of case named the Protege. The Protege is an arched (good protection) laminated (plywood) case covered in faux leather. Both modles of cases come in both Dreadnought and Classical guitar sizes. The unique feature of these is they have humidification chambers built into the case. You don’t need to hang anything inside the guitar nor try to find a position for a humidifier such as the Oasis case humidifier above. The humidifier uses a special activation solution. Although it doesn’t indicate what’s in the solution, my guess is this is a chemical solution designed to control humidity. I’ve been considering buying a classical guitar and if I do I will probably get a Humicase for it. I think the above summarizes the type of solutions available to you. But there are more systems than I can easily find. For example, there’s a system from Herco that I haven’t listed. It is similar to the basic systems listed. There’s nothing wrong with it – I just couldn’t find any literature to describe it. 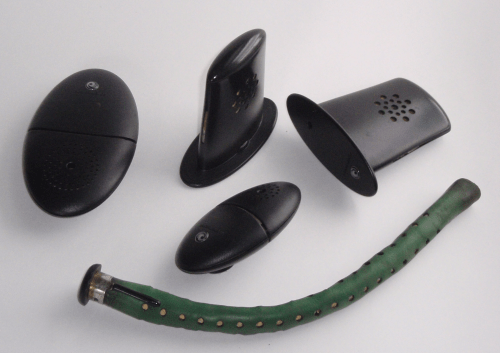 The following three items are more like the Planet Waves Humipak system. The last item allows you to get the features of the Humicase in your regular case.